My eyes popped open at 3:24 am. According to the official prom schedule, the post-prom party at Via Entertainment was ending at 3:30 am, so it seemed likely M would arrive home any time. She had no post-post-parties planned: her limo crew seemed a little too wholesome for truly extended partying. M, for one, is usually the first one asleep at sleepovers, plus she’d gotten home from Friday night’s track meet at midnight (Sophomore 1500 Champion, baby!) and had homework to do. Frankly, I was not convinced she had the staying power for all of this reveling. I had my phone on my nightstand just in case she wanted to bail out early and needed a ride. Her date’s parents were bringing them home. “I do have his parents’ cell phone numbers. I could text them.” We sat with that for a minute. We don’t know the parents well, just from idle chitchat at soccer games. A 4 am text felt like level-jumping. “Could she already be home and we just slept through it?” Cute W asked. This seemed impossible to me, just because Cute W’s a light sleeper. I can sleep through almost anything, but from what I can tell, one creaky floorboard can wake Cute W up. Still, there was an easy way to resolve that question. “One easy way to find out. . . ” I started, and got out of bed, snapped on the hall light, and headed to M’s door, Cute W right behind me. All we could see was a lumpy comforter, so it took me tiptoeing halfway into the room for M to give a little moan and turn over. There she was! So they must have dropped her off early-ish. In retrospect, she must have woken us up coming in, but we were so slow to reach consciousness that she’d tucked herself into bed before we knew what was happening. And of course she’d been the one to lock up! Anyway, she had fun at the prom. And of course she looked beautiful. 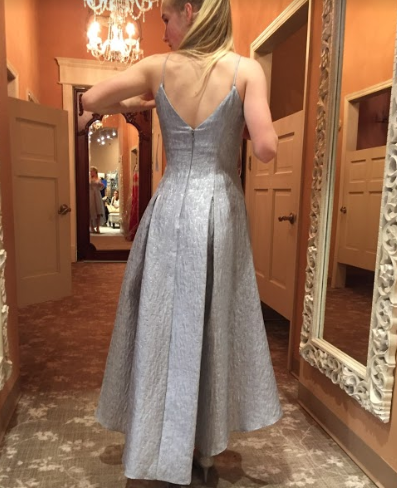 Here’s a view of the dress she wore, from the day we were shopping for it. It’s a lovely dress. . . with pockets! Plus it’s shorter length meant it was perfect for plenty of dancing. Back in Olden Tymes, we just did our best with making ourselves look cute, but pretty much everyone I knew was going to appointments of one sort or another. M got her make-up done, and it was. . . well, a lot more make-up than she usually wears, but she looked beautiful. We had decided to go DIY with the hair, though, and at about 3:15 pm yesterday I was really regretting this decision, because DIY really means MDI (Mom Does It) and Mom wasn’t entirely up to the task. But more on that tomorrow. However, I think it’s a little ironic that this prom is always held on Mother’s Day Weekend. I’m just saying: someone in our family got a manicure and their face made up and rode a fancy limo to go out for dinner and dancing and then spent the following day sleeping in, then lounging in a hammock. And it wasn’t the mother! And I am basically screwed, because next year M will definitely go to the prom (it’s for juniors, so that will be “her” year), then the following year M will be a senior and J a freshman, so it’s highly likely that one or the other will go, then we have J’s sophomore and junior years. . . it looks like I will not be the focus of Mother’s Day Weekend for the foreseeable future. Which is sort of how Cute W has been screwed from the start, since M’s birthday is always a few days away from Father’s Day. But it’s still kind of a bummer! It was a good Mother’s Day. We planted some new flowers, I got a gift I’d asked for (I’ll tell you about it later), and we walked to a Thai dinner. Hope everyone else had a great day.